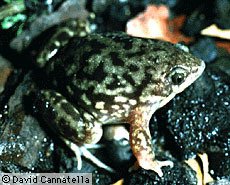 Hemisus are the Shovel-Nosed frogs of Africa. This frog burrows head-first in contrast to many other burrowers. The head is solidly bony, and the tip of the snout is pointed; the forelimbs are unusually stout. There are about eight species of Hemisus. The genus is usually placed in its own subfamily or family group. Duellman and Trueb (1986) treated this taxon as a subfamily of ranids. Laurent (1979) and Dubois (1981) listed it as Hemisidae; the appropriate form is Hemisotidae. Either family-group name is redundant with Hemisus, the only genus. Ford and Cannatella (1993) defined Hemisus to be the node-based name for the last common ancestor of species of Hemisus listed in Frost (1985), and all of its descendants. Synapomorphies include the lack of sternum (convergent with Rhinophrynus and Brachycephalidae) and a skull highly modified for head-first burrowing. Hemisus lacks a sternum, and has a vertical pupil, fused carpals and tarsals, and a notched tongue. The vertical pupil suggests that it is closely related to Hyperoliidae and the notched tongue suggests relationship to Ranidae. Page: Tree of Life Hemisus. Shovel-Nosed Frogs. Authored by David Cannatella. The TEXT of this page is licensed under the Creative Commons Attribution License - Version 3.0. Note that images and other media featured on this page are each governed by their own license, and they may or may not be available for reuse. Click on an image or a media link to access the media data window, which provides the relevant licensing information. For the general terms and conditions of ToL material reuse and redistribution, please see the Tree of Life Copyright Policies.